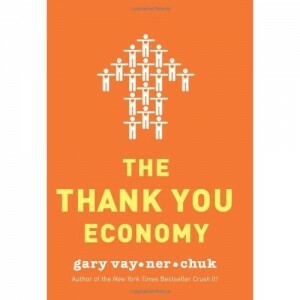 In @garyvee ‘s most recent book, The Thank You Economy, Gary makes a compelling argument for the use of social media. If you know of Gary you know that he has been a huge proponent of social media – despite hating the term ‘social media’ – and he has had a strong and steady rise into the spotlight. 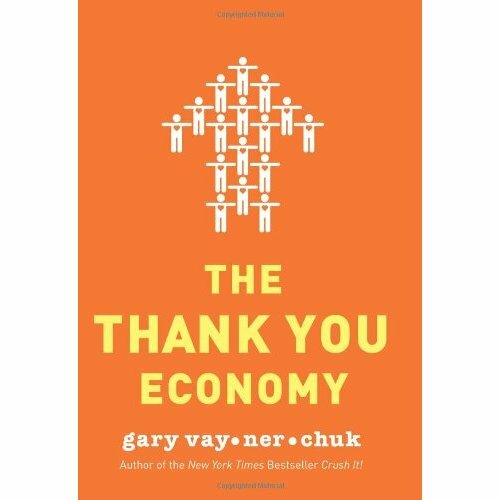 The Thank You Economy, TYE for short, is the essence of all of his bravado, condensed into an easy-read book that you’ll work your way through in a matter of hours. I give this book an 8 of 10 and would classify it as a long-form personal opinion (with a dash of how-to type talk and examples). The good news is that people that have not followed Gary and the social media trend (or have and don’t buy into it yet), this book is a great summary. Unfortunately, the opposite is also true. If you are a true fan of Gary and you follow his tweets, talks, Wine Library TV (now Daily Grape), Facebook (yes, he got /gary), etc. then this book will not hold any surprises. It will still be entertaining and may motivate you to some extent to go get after it, but it will not share some massive new insight that was heretofore unknown. Regardless of your exposure to Gary, the book is an interesting read with a unique perspective on the social media landscape – told from somebody on the bleeding edge of the trend and by an individual who couldn’t believe more in its power. He references the very well known Old Spice craze and shares his thoughts on how businesses need to get back to the basics. He often reminisces about old-school (“your grandparents generation”) ways of doing business, where they always knew your name. Back when shopping was an intimate experience and a place where people met. Oddly, it is an amazing parallel as people now share more than ever on websites and websites know more and more about an individual with every click. In a very real sense the ‘shopkeepers’ do know you by name. I actually found the most interesting part of the book after the conclusion in the area titled “Sawdust”. Here you get a rapid fire series of topics, some as short as one line, that Gary provides his opinion on. For any Gary Vay-Ner-Chuk fan(a Vaniac) this is a part of the book the really rings true. You can almost see him jumping from topic to topic in his trademark over-the-top ultra-sure manner that makes him so engaging to watch. It has been quite some time since I tore through a book but Tony Hsieh‘s account of his life, struggles he faced, and visions for the future of Zappos was easy to finish and hard to put down. I give this book an 8.5 / 10 and would classify it as an “inspirational” type book. To start at the end, Delivering Happiness is about the path to the current Zappos brand promise to deliver happiness – quite a bit more broad than the “largest selection of shoes” that was the promise in 1999. Continuing from the end backward, the book takes on the sale of Zappos to Amazon, the early (and tough) days of the company, Tony’s selling of LinkExchange, and it starts with some stories of what made Tony the person he is today. I think the thing that really makes this book so easy to read is that it reads more as a story than any sort of handbook, guide, biography, or company history. The book was particularly pleasant for me because I would stop and make parallels to my own youth along the way. It was fun to think about some of the things that I did growing up – some of the ‘business’ ideas that I tried and failed at. It also reinforced the simple truth: CEOs of the most successful companies were just kids at one point, making mistakes and learning along the way. This is a truth that would do many good to remember when they stumble in their lives. There were also moments of reflection for me while reading. Having worked at one of the great customer service companies, Lands’ End, I share a passion for the customer. A belief that we should try and help the customer. Some of the parallels of the companies are amazing. But at the heart of it one this is clear – both were the passion of their founders. One point that I want to emphasize is an idea that I have had for a long time and it is interesting to hear it from a leader like Tony, that a brand cannot exist with out a company culture that matches it. When looking for employment, schools, or areas to live this is a key thing to keep in mind. A nice job or a fancy house or the most elite school will do you no good if the culture doesn’t fit. You will not be happy. And, as is pointed out at the end of the book, the short term ‘pleasure’ happiness is not enduring. It is fleeting. A passion is what leads to longer term happiness and being part of something bigger than yourself lasts longest of all. Are you making choices to be happy? WordPress generated this page with 29 queries, in 0.066 seconds.